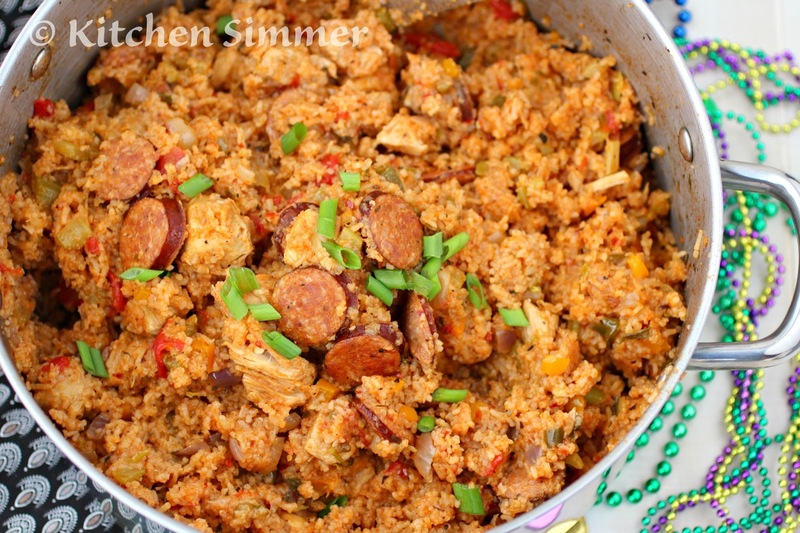 This one pot Jambalaya is filled with Andioulle Sausage, Chicken and Cajun spices. It is a fantastic meal to celebrate Mardi Gras. Tomorrow is Mardi Gras and we started the celebration early with this Spicy Andouille Sausage and Chicken Jambalaya. Mardi Gras, also known as "Fat Tuesday", is a day to eat some rich and fatty foods before the ritual fasting of the Lenten season, which begins on Ash Wednesday. This is a great one pot dish. You can't go wrong with rice and chicken. Then adding the andouille sausage just makes it even better. I love the Cajun spice mix I used to flavor the dish. 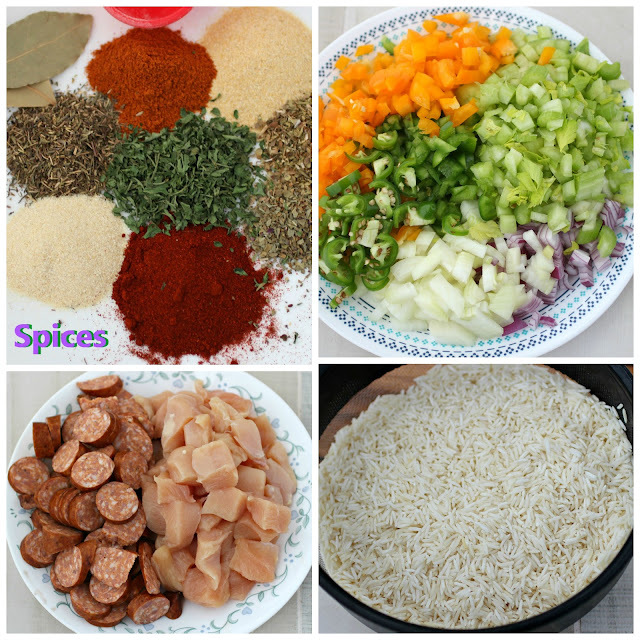 This spice mix can be used for most Cajun inspired dishes. I also made sure to use the "Trinity". The trinity is a mix of bell pepper, celery and onion. I got fancy and used one white and one red onion. I also used one green and one orange bell pepper. Of course I need to throw in some spice so I added a couple of jalapeno peppers as well. This week is a busy week for my kitchen. We have a lot of big events that center around food. We started the week with the Super Bowl, then the beginning of Chinese New Year and now Mardi Gras. I will be making a dish to celebrate Chinese New Year this week and will also share a fun snack my kids and I made for the Super Bowl. After all this eating, I may have to start a juice fast next week. Step 1: Wash and rinse the rice well and place in a strainer to dry out. Step 3: Heat 2 Tbs canola oil in a large heavy based pot. Add the chicken and andouille sausage. Season with a little salt and black pepper. Cook for 3-4 minutes. Step 4: Next add the trinity vegetables and the jalapeno pepper. Season with a little more salt and black pepper and saute for 3-4 minutes. Step 5: Add the seasoning spices and bay leaves. Toss all ingredients together for 1-2 minutes. Step 6 : Add diced tomato can and mix with other ingredients. Step 7: Add the washed/drained rice. Step 8: Add chicken stock and Worcestershire sauce. Stir well and bring all ingredients to a boil. Then lower to medium heat and simmer for 20-25 minutes. Once rice is cooked, mix well and serve hot. Enjoy. Lots of events happening back to back and Valentine's Day is just around the corner too! 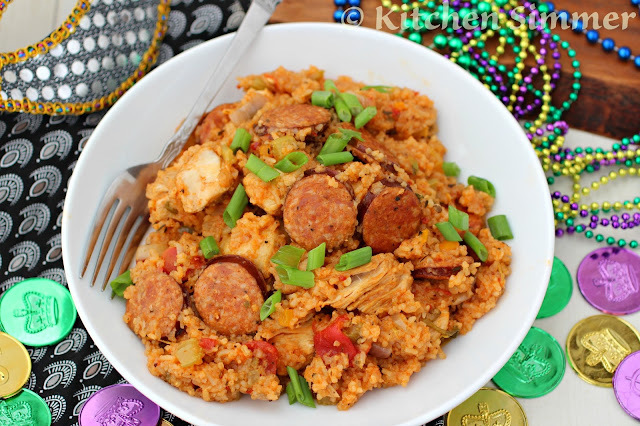 Love this jambalaya and perfect for Fat Tuesday! I love the combination of chicken and sausage. We add shrimp sometimes, too. The flavor is always great! I've had Jambalaya only once and tat was made by a friend. I loved it so much but it just came like a complicated dish to me, now I see your recipe and it's just so simple and clear! I would love to try this in my own kitchen! Delicious combination Ramona! I love jambalaya! What a great dish to celebrate Fat Tuesday! We love anything spicy and this certainly fits the bill -- thank you for sharing. Wow, it looks great. My mouth is already watering. Feel like preparing it now. Anyway thanks for the share. My mouth is salivating over here! 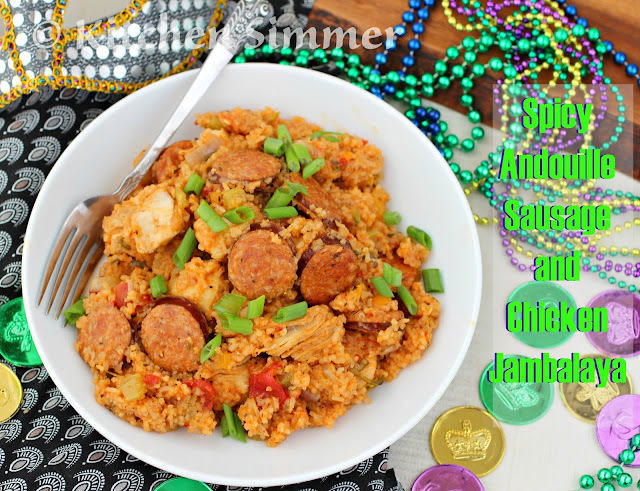 I LOVE Andouille sausage in jambalaya! One of my favorite dishes ever! It feeds a crowd and is easy to make. My parents were from Louisiana and we ate tons of this growing up. Love all those spices! What did you use to strain the rice? We have Carnival here. :) Interesting photo shoot and a yummy dish.